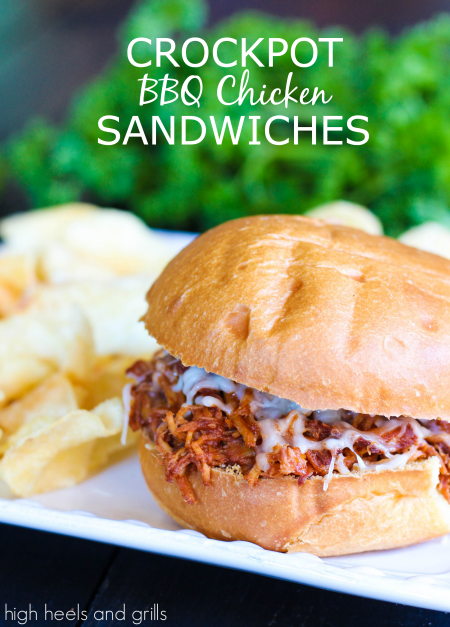 Are you ready for the best pulled BBQ chicken recipe that you’ve ever tasted in the history of ever? I know that sounds a little bit extreme, but I think it’s justified. I tried this recipe for the first time at my mom’s house and I loved it so much that this is what we served after Adelaide’s baby blessing in our church. We have had it multiple times since then, but I haven’t been able to get a picture because it’s usually gone by the time we get around to it! I love that it’s made in the crockpot too. Those are the best kinds of recipes. I’m pretty sure I need more of them in my life. Mix the rest of the ingredients in a medium bowl and then pour over the chicken, stirring until chicken is completely coated. When chicken is completely cooked, shred it with a fork and return back to the crockpot, mixing with the remaining sauce. Spoon about 1/3 cup chicken onto hamburger buns and top with cheese. Hi Sarah, please how do I get Sweet Baby Ray’s Original BBQ Sauce and Worcestershire sauce in Nigeria.I would love to make that everyday of my life and probably even make a business out of it, who knows? Advise please.